When I reviewed the Cardiff performance of this opera given at the Sherman Theatre on 11 April 2014, I concluded my comments with a plea for a recording of the work. Well, here it is, set down under studio conditions during the two days preceding that stage presentation. The fact that we can now appreciate John Metcalf’s musical treatment of the Dylan Thomas text in such a form is indeed to be welcomed. I make no apology for repeating in this review much of what I had to say in my original notice of the stage production. In fact the original stage production was fairly minimal, reflecting the work’s origins as a radio play. At the time of his death Dylan Thomas was contemplating the composition of an opera libretto for Igor Stravinsky. This never materialised and Stravinsky contented himself with writing his In memoriam Dylan Thomas employing in its central section a setting Thomas’s poem Do not go gentle into that good night. Unfortunately for those of us who love Dylan Thomas, the results were less than satisfactory. Stravinsky’s employment of an angular musical language appeared to deliberately set out to go against the grain of Thomas’s poetic diction. Given Thomas’s noted dilatoriness in responding to commissions – the gestation of Under Milk Wood took some ten years – it may be doubted that the projected collaboration would ever have actually been consummated. The radio play Under Milk Wood was also left in a state of some chaos at the time of Thomas’s death. In May 1953, six months before the poet’s death, a rendition was given in New York – a recording of this performance exists – but Thomas then continued to revise the work for the BBC radio production which only took place two months after his death. There is some doubt as to what in fact his final intentions for the text were, although in his booklet notes for this release Peter Reynolds seems to suggest that the work was completed. Nonetheless the final version as now established was to some extent the creation of Welsh composer Daniel Jones, a friend of the poet, who had to put the final scenes into order. The play has formed the basis for operatic treatment before. Austrian composer Akos Banlaky attempted a setting (in German translation) some years ago which was not well received, possibly because of some producer’s glosses which went against the grain of Thomas’s carefully contrived Welsh milieu. These included the conversion of the Reverend Eli Jenkins into a Catholic priest. There has also been a French version by François Narboni but so far as I can tell John Metcalf is the first composer to have attempted a setting of Thomas’s original. Metcalf has inevitably made considerable cuts in Thomas’s wordy original in order to bring the opera within reasonable confines of time. In view of the poet’s own indecision about the final text this cannot be objectionable. As it is we have over an hour and three-quarters of music, which revolves around a slow-moving chromatic sequence of keys depicting the passing of the day; these are identified in the track-listing on the back of the booklet. The Swansea première seems to have attracted fairly limited attention from national critics, but those who did attend – John Allison and Rian Evans in particular – seem to have garnered favourable impressions. That said, adverse comments were made about the fact that Thomas’s sometimes earthy humour was under-characterised. I must admit that I find these criticisms misplaced. There is not only plenty of variety in the textures and settings but there is also an admirable admixture of humour in a manner that we have not heard in modern opera since the death of Ligeti. By this I mean sheerly musical humour, not just amusement which arises from the text or some quirk of directorial inspiration. Using a very small but resonant ensemble of instruments — which come across even better in the church acoustic of this recording than they did in the theatre — Metcalf ensures that much of the text is clear even to those unfamiliar with the original play. This is just as well, as no text is provided with these CDs. Most of the words come across loud and clear, although inevitably the male voices fare better in this respect than the female ones. The studio recording makes sure that we miss very little. The singers are a very mixed bunch, ranging from full operatic style — Paul Carey Jones particularly impressive with every word delivered with relish — to a cabaret-type performance from Wyn Davies as Organ Morgan (again every word crystal-clear). Davies also directs the performance from the keyboards. The other singers take on multiple roles and chorus — only the principal roles are listed above — sometimes switching from one part to another with a speed which occasionally takes the listener by surprise; any such confusion is quickly resolved. The orchestral players also move quickly between various instruments, and some characters – such as the Reverend Eli Jenkins – are distinguished by the use in the accompaniment of traditional Welsh instruments. These include a Celtic harp and the crwth, a sort of bowed lyre with sympathetic strings. Some of the singers also participate in the provision of additional percussion effects, and there's even an accordion part played with delightful insouciance by Paul Carey Jones. The reviews of the Swansea production drew attention to Metcalf’s use of sound-effects which were regarded as a reflection on the play’s origin as a work for radio. In fact these effects, never just electronic additions to the score which draw unwanted attention to themselves, are subtly integrated into the whole in a manner which adds atmosphere without sounding at all out of place. Again they sound even more effective in the studio than they did in the theatre. One is delighted to be able to report that Metcalf is willing to allow Thomas’s songs to be heard to their full effect in a series of often very beautiful arias, of which Polly Garter’s returns at intervals as a sort of refrain. These are radiantly sung by Elizabeth Donovan. The Reverend Eli Jenkins has two poems to recite in the play, and these were clearly intended by Thomas to be gently satirical in intent. The preacher is a dilettante whose rhymes are often all too predictable, and his heartfelt ruminations about life in Llareggub are undermined by his lack of poetic imagination. Eamonn Mulhall delivers both settings with charm and grace. Thankfully Metcalf treats the Evening Hymn (CD2, track 6) light-heartedly. This is done in a way which gives a far better impression of Thomas’s intentions than the syrupy sentimentality of the arrangement of the words to the tune of Troyte’s chant which is so often inflicted on us. Following this Richard Morris makes a real tour de force out of Mr Waldo’s song (CD2, track 8), with the other singers gathered into a surprisingly well-integrated supporting chorus. Helen-Jane Howells and Gweneth-Ann Jeffers also make their own impact in a series of character roles. The light-hearted treatment also has the advantage of drawing attention to the emotional core of the play: the encounter between the dozing Captain Cat and his long-dead love Rosie Probert (CD2, track 3). Metcalf makes sure that this confrontation comes across with the full force that it needs. Michael Douglas Jones — who also subsumes the key narration of the First Voice into his role — and Karina Lucas begin simply, with their words underpinned by violin and flute players and a simple keyboard accompaniment. Then, as the music gathers pace, the addition of the percussion and harp comes across with the impact of a thunderbolt. This sort of moment is rare in opera, and almost unknown in modern scores. Even when one can appreciate the means by which the composer has achieved the effect, the electric charge of the music cannot be gainsaid. 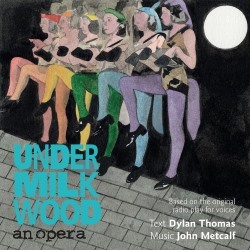 Under Milk Wood in John Metcalf’s treatment is a work that communicates immediately with its audience, drawing them into the action not only by dramatic means but also by the sheer persuasive power of the music. That surely is what opera is all about – or should be. The opera is inevitably split across two CDs, which interrupts the continuous flow of the music but the break is well chosen and inoffensive. Incidentally the track-listing on the back of the booklet is misleading, since it continues the numerical listing from the first CD instead of beginning again at track 1. The references given in this review have been corrected accordingly. Although, as I have noted, the booklet does not give us the sung text, this is entirely drawn from the original play and there is no difficulty in identifying the passages that the composer has omitted. What the substantial booklet does provide is comprehensive biographies of all the performers as well as a survey by Peter Reynolds of the history of the play and of John Metcalf’s earlier operatic works, together with Welsh translations and photographs of the original stage production. I understand from the composer that this production has been nominated for the world première category of the Opera Awards 2015, and that these CDs are to be launched for the worldwide market at Opera America in New York on 27 February. I hope that this will lead to increased interest in a modern opera that deserves the attention of all those who are concerned about the future evolution of the musical stage.